This lil Rooker fan is one tough little superhero – we call him TJ. TJ has been diagnosed with Diffuse Intrinsic Pontine Gliomas (DIPG). DIPG is a brain tumor found in a part of the brain stem called the pons. The pons controls essential bodily functions such as heartbeat, breathing, swallowing, eye movement, eyesight, and balance. Approximately 200-400 children in the United States between the ages of 4 and 11 are diagnosed with DIPG each year. Doctors use radiation to help shrink the tumor but it almost always comes back even more aggressively. It is a horribly devastating disease. I am like most people in that if it does not affect me personally I don’t know about it, until it’s at my front door. 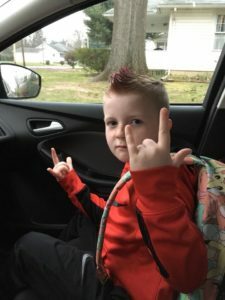 Needless to say I am learning all about DIPG now, because it is not only at my front door, it has entered my heart… this little superhero is my niece’s son. The tumor has diffused or spread into his brain stem and there is no cure right now. I will be helping as much as humanly possible. But needless to say, every little bit counts. Today we had an unplanned appointment in Chicago for Timothy. He has been sick for a few days, throwing up, body aches, not eating, sleeping all day. They did an MRI today and the tumor has gotten slightly bigger. Unfortunately this means the clinical trial meds didn’t work and aren’t going to work. Timothy has been in so much pain where we couldn’t even hug him or help him in bed without him crying. The doctors told us that there’s no reason to keep him on the clinical trial meds because it was just gonna keep him miserable. As parents we didn’t want to hear this. Then they told us that w/ or w/out meds they only give him about 2 weeks to a month-ish. We asked if we could do a different clinical trial but his blood counts are to low for him to be able to do any trial. Something else that we didn’t want to hear. Our hearts were ripped out and we had to make the worst decision to go ahead put him on pain meds and have hospice come and just keep him out of pain. We just don’t want our baby to be in pain anymore we honestly felt like the worst parents in the world telling these doctors okay we’re gonna go this route. He does not know what’s going on he just knows the meds are not working and they have to get out of his system for him to feel better. Thank you all for your kind words, prayers, donations and everything you have done for our family. We appreciate everything. We need a cure because these kids deserve better! !